Tactical combat training being carried out at Camp Pendleton. Image courtesy of Lance Cpl. Ali Azimi. 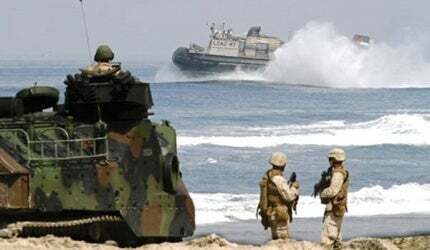 Amphibious Assault Vehicles set to undergo various amphibious assault tactics at Camp Pendleton. Image courtesy of Lance Cpl. Michelle S. Mattei. Live fire training exercise being carried out at the camp base. Image courtesy of Lance Cpl. Derrick K. Irions. The base provides amphibious training to the US Marine Corps personnel. Image courtesy of Don Bartletti. Pivot and shoot training exercise at Camp Pendleton. Image courtesy of Capt. Paul L. Greenberg. The base also has marine test facilities. EFV Program Office Photo. Marine Corps Base Camp Pendleton is the largest amphibious training base camp of the US Marine Corps in the West Coast. Covering 125,547 acres on the Southern California terrain and a shoreline of 17.1 miles on the Pacific Coast, the base accommodates about 70,000 people. The base was named after Maj. Gen. Joseph H. Pendleton. Its construction began in April 1942 with the Marine Corps acquiring the land by paying $4.23m. The base camp facilitates sea-to-shore training including other military sectors such as armour, infantry, supply and air power. It has more than 42,000 active duty personnel. "Camp Pendleton is situated between San Diego and Los Angeles." Camp Pendleton is situated between San Diego and Los Angeles. The base camp is surrounded by the military town of Oceanside to the south, City of San Clemente to the north and the City of Fallbrook to the east. The camp connects Oceanside through the main gate in the south and the eastern part through Fallbrook Naval Weapons Station gate. The main base of the camp is located at the end of the base in the southeastern part known as the Mainside Complex , while the northern interior part of the base acts as an impact area. Naval Air Station Joint Reserve Base (NAS JRB) New Orleans is a US Navy installation located in Belle Chasse, Louisiana, US. The idea to build a training camp within the present Camp Pendleton site was first conceptualised by the US Army, but saw no further action. The Marine Corps’ acquisition of the land led to the creation of its largest amphibious training base. The camp was declared as a permanent installation in 1944. The 1st Marine Division took over the base camp in 1946. The base was further upgraded with a budget of $20m during the Korean War, which upgraded the amphibious training base to an expeditionary training base. "The base camp currently has more than 2,600 buildings, 530 miles of roads and 14 railroad tracks." Camp Pendleton serves as a base for the I Marine Expeditionary Force which consists of units such as the 1st Marine Division, 3rd Marine Aircraft Wing, 1st Air Naval Gunfire Liaison Company, 1st Marine Logistics Group, 11th, 13th and 15th Marine Expeditionary Units, the MEF Headquarters Group, and the 1st Marine Expeditionary Brigade. The base camp also provides for Marine Corps Station at Munn Field, Assault Craft Unit 5 (ACU-5), Wounded Warriors Battalion-West, 1st Marine Special Operations Battalion, Marine Corps and Army Reserve Forces, Naval Hospital, 1st Dental Battalion and Reserve Units. Facilities at the camp also include schools and training centres. The base camp currently has more than 2,600 buildings, 530 miles of roads and 14 railroad tracks. Other facilities include 18,000 billeting spaces, 150 miles of sewer lines, 25 water reservoirs, 145 miles of gas lines, 335 miles of electrical lines and 215 power substations. Efforts are being put to make the base camp environment friendly and preserve the many endangered species located within its vicinity. The initial training facilities at the base camp consisted of a landing craft school, an amphibious tractor school, a beach battalion school, an amphibious communications school and a medical field service school. A new recruit weapons training facility was set up in 1961. Camp Pendleton is one of the five sites under the Department of Defence’s (DoD) jurisdiction to operate the Standard Terminal Automation Replacement System (STARS) air radar. The base camp also provides for several state of the art firing ranges, landing beaches, parachute drop zones, aircraft bombing and strafing ranges, mock urban warfare towns and manoeuvre areas.